Thought I’d post a few pictures today. 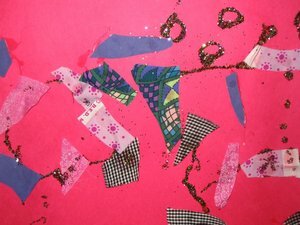 The first one is Emma’s glue project this morning with glitter and scraps of fabric. Last night when I was putting her to bed, she had the idea for this project and in her typical obsessive way, she wanted me to go downstairs right away and get everything set up for first thing in the morning. I managed to get breakfast into her before we jumped in to art projects. Before children, I never could have imagined that I had the ability to wash dishes, fold a load of laundry and be up to my elbows in glitter all before 7:30 am. 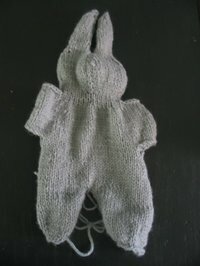 This other picture is of a bunny I’m knitting for one of the girls. All I have to do is stitch up the seams, (although my only darning needle rolled behind the bookcase this afternoon, so….waiting for Dan to get home and move it) . I got the pattern for this bunny from here. It was pretty easy to follow. I checked some other books out of the library earlier this week. "Beginner Baby Knits" and "Last-Minute Knitted Gifts" and they have some other cute patterns that I will try next. I’ve become obsessed lately with knitting animals. I thought about posting a picture of my spotless house, after my Mother-in-law whisked through yesterday. But I can’t, because its not clean anymore. Thank you, tornado children! Well, at least it’s clean underneath the mess. first off I love the glitter project and I love that her inspiration came the night before. What a creative girl! 🙂 And she wanted it all ready to go … so seet. The bunny is adorable. 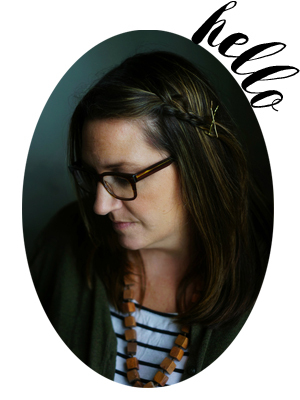 How do you get crafty things done with 2 kids… you and Joy amaze me like that. I’m lucky to blog and do emails!